The hero of the Odyssey. Odysseus fought alongside the other Greek kings at Troy and now struggles to escape his imprisonment and return to his family in Ithaca. King Odysseus is married to Queen Penelope, the two have a son named Prince Telemachus. Despite being strong and brave, he is most recognized for his charm. The goddess, Athena, takes a liking to Odysseus and regularly comes to his rescue. However, the king is the mortal enemy of the god of the sea, Poseidon, who never misses an opportunity to wreak havoc on his journey. The son of Odysseus and Penelope, he was just an infant when his father left for Troy. As the Odyssey begins, Telemachus is believed to be around twenty. He stands in the way of a group of suitors who are all vying for the chance to court his mother, the queen. However, despite being courageous and a generally good man, Telemachus lacks the stamina and the confidence to stand up to them. As he matures, largely as he ventures to Pylos and Sparta, along with the aid of Athena, his outlook changes and he becomes more willing to take a stance. She is the mother of Telemachus and the wife of Odysseus. Queen Penelope spends her days inside the palace yearning for her husband who has been gone from the kingdom for nearly two decades. She is portrayed as being excitable and flighty, but also steadfast, intelligent and loyal to her husband. The goddess of wisdom, purposeful battle, and the womanly arts, Athena is the daughter of Zeus. She aids Odysseus and Telemachus many times throughout the epic tale of the Odyssey, and she stands up to the council of the gods on Mount Olympus on their behalf. Athena often appears disguised as Mentor, believed to be an old friend of Odysseus. Poseidon is the god of the sea, he harbors an unwavering grudge towards Odysseus. He hates the king for having blinded his son, the Cyclopes Polyphemus and spares no opportunity to wreak havoc on his journey back to the kingdom. The king of the gods, Zeus oversees the meeting of the gods on Mount Olympus as they weight the fate and future of Odysseus. Occasionally, Zeus is seen weighing men’s fate in his scales. He often helps Odysseus or has Athena go to his aid. One of the suitors of Penelope, Antinous is the most arrogant. He spearheads a campaign to murder Telemachus. Unlike the other men in the mob of suitors, he is never seen sympathetically. When Odysseus returns, Antinous is the first to die. He is a manipulative and deceitful man. Eurymachus is one of the suitors, and capable of influencing the others thanks to his charisma. A member of the mob of suitors, he is regarded as being the only decent man hoping to ask Penelope for her hand in marriage. Amphinomus can sometimes be heard defending Odysseus and Telemachus, however, he also dies in the end. A loyal shepherd, who with the assistance of Philoetius, aids Odysseus in taking back the kingdom. 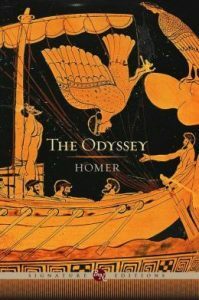 Despite not knowing that the beggar who attended his hut was Odysseus in disguise, Eumaeus welcomes the man and gives him food and a place to stay warm. She is the elderly servant who nursed both Odysseus and his son Telemachus when they were infants. Eurycleia serves as a confidante for her masters. She keeps Telemachus secret journey from Penelope, and later keeps the identity of Odysseus secret after recognizing him in his disguise. He is the brother of Melantho and an outspoken supporter of the suitors. He hurls insults to the beggar who appears at the palace, not realizing that it is the king. Calypso is the beautiful nymph who becomes lovesick for Odysseus and imprisons him on her island of Ogygia. She holds him captive for seven long years, and does not free him until Hermes, sent by Zeus, persuades her to allow Odysseus to craft a ship and sail home. A member of the Cyclopes, and the son of Poseidon. Odysseus comes upon the island of Polyphemus soon after leaving Troy, where he and his men are imprisoned. Polyphemus plans to eat the men, but Odysseus uses his wit to outsmart the Cyclopes and ends up blinding him, starting a lifelong grudge with Poseidon. Circe, in the Odyssey, is the beautiful witch-goddess who turns Odysseus’s men into swine when they come upon her island. Aided by Hermes, Odysseus is able to resist her powers and, instead, becomes her lover. He lives a luxurious life on her island for one year. The father of Odysseus, Laertes lives on a farm on the outskirts of Ithaca. He is depressed and in steadily declining health. He is rejuvenated by the return of his son and eventually thwarts plans to kill his family by killing the father of Antinous. The king of Pylos and a warrior of the Trojan War. Nestor is known for his silver tongue. The king of Sparta, the brother of Agamemnon and the husband of Helen, he lead the Greek warriors in the Trojan War. He offers to assist Telemachus in his journey to find his father.